Somewhere between the ages of 15 to 25 years, most people's third molars begin to erupt through the gum line at the very back of their mouths. However, the modern jaw shape often can't accommodate wisdom teeth, leading to either of two unhealthy conditions: crowding of existing permanent teeth, or impaction—the incoming molars get stuck in place. Since few people’s jaws can accommodate these large third molars, we typically examine our 11 and 12-year-old patients to predict the upcoming developmental positioning of the wisdom teeth, recommending extraction prior to 17 to 19 years of age. While extraction may not sound like a lot of fun, it's far better than the typical alternatives. Crowded teeth can misalign your bite, cause jaw pain, and lead to gum disease, causing dental problems for the rest of your life. 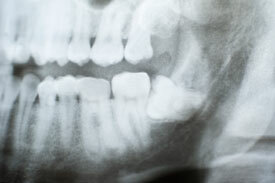 Partially-erupted wisdom teeth allow bacteria and germs to multiply, leading to infection or cyst formation; tumors may even grow on a trapped wisdom tooth. Impacted or partially-erupted wisdom teeth may force entry, pushing up in whichever direction they find the most give: sideways, vertically, backward, forward. They can become stuck while still fully encased in the jawbone (called a bony impaction), or prior to erupting through the gums (called a soft tissue impaction). Such impaction can cause pain, swelling, and infection. The good news is that extraction is a simple, routine surgical procedure that can usually be performed comfortably in one office visit.